Filmography Derek George Jacobi was born in East London suburb, on October 22 1938. When he was a child, he manifested an early interest in theatre. At Cambridge, he joined the Amateur Dramatic Club, and the Marlowe Society, where he played, among other roles, the title part in Christopher Marlowe's "Edward II." After graduating from Cambridge, he was accepted by the Birmingham Repertory Theatre. He stayed there several years, until Sir Laurence Olivier offered him a job at the Chichester Festival Theatre. In 1963, Olivier invited Mr. Jacobi to join his newly-formed National Theatre Company. He stayed there for the next nine years, playing such roles as: Laertes in "Hamlet" (his London debut); Cassio in "Othello;" Prosorov in "The Three Sisters;" and Simon Bliss in "Hay Fever" (directed by Noel Coward). He left the National in 1971, and returned to the Birmingham Rep. In 1977, he gained international acclaim for his "Hamlet," touring England, Egypt, Sweden, Finland, Japan, and China. From 1980 to 1994, he played in differents theaters in England and also in Broadway. 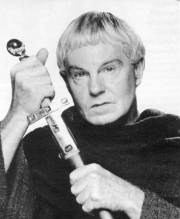 Television and movies characters played : Adolf Hitler, Dom Claude Frollo(The Hunchback of Notre Dame) and of course Brother Cadfael. Filmography : The Day of the Jackal;" "The Odessa File;" "Enigma;" Mr. Branagh's version of "Henry V;" "Little Dorrit;" and most recently in the role of Claudius in Kenneth Branagh's "Hamlet".